Accommodation will be available in single college rooms for £31 per night, bed and breakfast. These student rooms do not have en suite facilities, but they are attractively situated, some in historic buildings. By international standards the undergraduates of Peterhouse live quite comfortably. It is hoped that many delegates will choose to stay in College. The cost is significantly lower than that for even modest hotels in the city centre. We regret that the Governing Body of Peterhouse do not allow children under 14 within the College: we offer suggestions below regarding accommodation for families with children. Bookings for accommodation in Peterhouse may be made now. The minimum booking is for the four nights beginning Friday 13th July 2001, giving a total cost of £124. Extra nights are available at £31 per night. The rooms are for single occupancy only, but we can arrange adjacent rooms for partners travelling together. 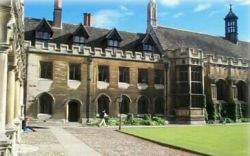 Accommodation in Peterhouse should be booked directly with the conference organisers, not with the college. It is only necessary to write to us giving the dates you require and enclosing payment. Payment can be by sterling cheque, by international money order, or by bank transfer. Details and a printable registration form can be found on the registration page. The address for booking is: Professor J. D. Mollon, ICVS2001, Department of Experimental Psychology, Downing Street, Cambridge, CB2 3EB, United Kingdom. There are a variety of hotels and guest houses in central Cambridge. If you would prefer to stay outside college, please make a booking directly with a hotel or guest house. Bookings should be made well in advance and with circumspection, since July is high season for visitors to our city, the hoteliers are in a sellers' market, and some hotels lack charm. A comprehensive list of hotels will be found at the City Council Server or Hotelnet (online booking possible). We mention below some hotels and guest houses that recommend themselves on account of either proximity or pleasant location or both. These span the range of typical prices available in the city. For those seeking a high level of comfort, the Garden House Hotel may recommend itself. The hotel is very pleasantly situated on the river and is adjacent to Peterhouse, thus being the most convenient hotel for the meeting. Bookings should be made directly with the hotel. The Reservations Supervisor has quoted us special rates of £104 per night single, £183 per night double, in both cases for a riverview room and including breakfast. These rates do appear to be lower than some publicly advertised for the hotel, but it is possible that you could secure still more advantageous discounts through an agency or by booking via the Web (The hotel is part of the Moat House chain). If booking directly with the hotel, specify that you want the rate that has been offered to the conference organisers. The telephone number of the Garden House Hotel is +44 (0) 1223 259988 and the fax number is +44 (0) 1223 300483. The Meadowcroft Hotel is a small, privately owned hotel, recently opened in a refurbished Victorian house. It is handsomely furnished and is set in its own gardens. It lies on Trumpington Rd, about 20 minutes walk from the lecture theatre at Peterhouse. There are two pleasant walking routes to Peterhouse, one along the road, past the Botanic Gardens and Hobson's Brook, the other across Coe Fen and along the river. Alternatively, there are regular buses to the city centre; and the hotel has one or two bicycles for hire. The prices during the year 2000 are £120 per night double, £85 single, and £140 for a family, but there is a weekend rate of £100 for double rooms and this will apply to part of the conference. The public rates will be higher in 2001, but the owner has agreed to hold the 2000 prices for members of ICVS: please mention the conference when booking. The prices include a full English cooked breakfast and Value Added Tax. All rooms have an en suite bathroom, facilities for making tea and coffee, and a satellite television. The family suites have a convertible sofa on which children can sleep. The address of the hotel is Trumpington Road, Cambridge CB2 2EX. The telephone number is +44 (0) 1223 346120, the fax number is +44 (0) 1223 346138, and the electronic address is meadowcroft@meadowcrofthotel.co.uk. The local Organising Committee recommends the Meadowcroft Hotel as a charming and comfortable hotel for those wishing to stay outside Peterhouse. It may be particularly suitable for those bringing families. The Arundel House is the one Cambridge hotel to secure a mention in the current "Good Hotel Guide". It is 20 minutes walk from Peterhouse, but the walk is a very pleasant and diverting one, across Jesus Green and along Trinity Street and King's Parade. The prices quoted to the conference organisers are £88 per night double and £62 single (refer to these prices when booking). The prices include a full English cooked breakfast and Value Added Tax. All rooms have an en suite bathroom and facilities for making tea and coffee. The address of the hotel is Chesterton Rd., Cambridge CB4 3AN. The telephone number is +44 (0) 1223 367701 and the fax number is +44 (0) 1223 367721. Segovia Lodge, 2 Barton Rd. Bed and breakfast accommodation, Portuguese-run, a pleasant ten-minute walk from Peterhouse, across water meadows. They have one double room (en suite), one other double room, and one twin room. Neat, simple in style. Current prices are in the range of £50-60, for a double room, including breakfast. The en suite double room overlooks the playing fields of Gonville and Caius and seems good value to the conference organisers. Telephone +44 (0) 1223 354105, fax +44 (0) 1223 323011.